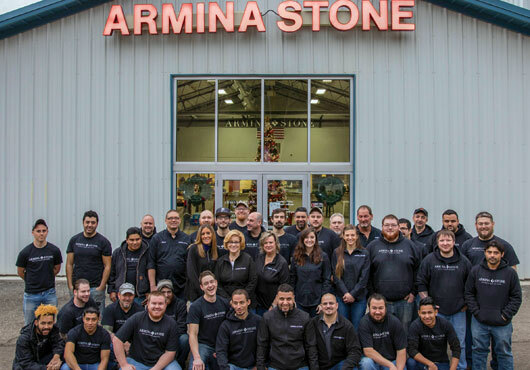 Since opening Armina Stone in 2015, CEO/founder Emre Basman (back right) and his team, Kathy Balsamico, General Manager (back left), Mike Renaldi, Operations Manager (front left) and Taylor Noe, Sales Manager (front right), continue to outpace their ambitious business goals in terms of revenue and customer base, for the import, fabrication and installation retail company. Camped out on a mountain peak in Italy’s Apuan Alps in northern Tuscany, Emre Basman knew he’d found a focus for his entrepreneurial heart. At the time, the then 25-year-old was a buyer for a stone company in the U.S. It was one of many adventures that Basman would embark on over the next few years, as he learned all he could about the stone business from selection to installation, built relationships and shaped his vision for his own operation that would become Armina Stone. Soon after earning his business degree in 2001, Basman began his career as a buyer in the specialty building supplies space. A few years later, while earning his MBA, he took the first step toward independence when he bought four containers of slab, each container holding about 42 slabs, from a supplier in Turkey. He then sold them to fabricators, all the while learning about the fabrication and installation process. He further worked at Europa Stone for a few years and then opened Stone & Tile Expo, a distribution center in Chantilly, Virginia, in 2008. In 2014, he moved to Pittsburgh, ready to venture in a new direction. Basman also joined the Builders Association of Metropolitan Pittsburgh and now serves on its board. At the same time, he formed the Pittsburgh-based Stone & Tile Expo wholesale operation located in an 11,000-square-foot warehouse and set out to build relationships in the community. By 2015, Basman was ready to establish his vision, Armina Stone, as an import, fabrication and installation retail company. Today, Armina Stone is Pittsburgh’s largest stone gallery and Basman is well on his way to building a dominant presence as a premier stone importer, fabricator and installer in the Northeast. Only three years old, Armina Stone boasts over 5,000 slabs and almost 500 colors and serves a diversified customer base that ranges from small residential customers to high-rise condos and commercial buildings to big box commercial ventures. His company’s work has been featured on high-profile television and in print media, such as HGTV and Pittsburgh Magazine’s Ultimate House. While the products and services are certainly remarkable, it’s Basman’s energy that is immediately visible to all those who visit his warehouse or talk with his talented team. With more than 30 years in the stone business, Balsamico soon took over as General Manager of Armina Stone. Around the same time, Basman hired Mike Renaldi, a contractor with more than 20 years of experience, as his Operations Manager to handle the construction side of the business. Two other members of his team include Taylor Noe, Sales Manager, who has a degree in Interior Design and Dave Nowak, the Fabrication Manager with over 15 years of experience running a fabrication shop. In 2016, Basman, with help from his expert team, expanded the warehouse and fabrication shop from 11,000 square feet to 40,000 square feet and bought another 100 containers of stone products—including granite, soapstone, travertine, quartz and marble—from Italy, Spain, Brazil, Turkey and India. He also built a slab showroom alongside the warehouse. As well, Basman made a huge investment in technology for his fabrication shop, including robotic technology, waterjets, CNC machines and LT55 laser templates—all managed by Randy Morgan, one of Basman’s first employees. Morgan is a 19-year veteran of fabrication operations and serves as the firm’s Robotics and CNC Manager. A year ago, Basman and his team had to expand the warehouse again from 40,000 square feet to 60,000 square feet to accommodate the growing number of colors and styles. In the last year, the company has doubled revenue. Just as important to Basman is the “feel” of the company. Armina Stone currently employs 60 people, who all know Basman by first name. He has local inspectors on retainer in Brazil, Italy, Spain and Turkey who send him pictures of products and samples to consider for purchase. He also travels to the international tile and stone conferences to meet with quarry owners, who have become his friends and colleagues. Basman and his team have already taken steps to double revenue in 2018 by expanding their customer base beyond the Northeast, just as Basman envisioned while sitting on top of that mountain in Tuscany 15 years ago.